War crimes prosecution can only happen under a regime change, experts say, as Assad is likely to be involved in any short-term solution. 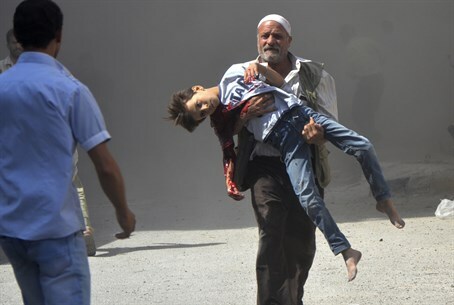 The chances of anyone being prosecuted for Syrian war crimes are today smaller than ever, experts say, as realpolitik smothers an increasingly solid mountain of evidence accumulated during the often barbaric four-year conflict. Rights groups have steadfastly documented atrocities committed on the ground, and on Wednesday a committee of renowned investigators said it had enough evidence to prosecute up the chain of command to President Bashar al-Assad himself. But while those dossiers, collected by the Western-backed Commission for International Justice and Accountability (CIJA) including former investigators from international tribunals, claim for the first time to be "trial ready," the world is not. For political reasons, there is no court able to judge the crimes committed in a conflict that has killed more than 220,000 people, including at least 67,000 civilians and 11,000 children. "It's very likely that no conflict has ever received as much investigatorial attention of mass atrocities, war crimes and crimes against humanity, with so little justice," London-based international law expert Mark Kersten told AFP. The International Criminal Court, which judges the world's most serious crimes, has no jurisdiction in Syria as it is not a member and ally Russia is expected to block the UN Security Council from authorizing an ICC investigation. At the same time, many now consider Assad a "necessary evil" in any peaceful end to the conflict, so the international community is also unlikely to set up an ad hoc tribunal such as that created after the 1990s wars in the former Yugoslavia. "You have to wait for regime change in Syria, for a post-revolution truth commission, fact-finding and settling with the past by a new administration," Olivier Ribbelink, senior researcher at the TMC Asser Institute in The Hague, told AFP. Some countries have universal jurisdiction laws that allow them to prosecute crimes not committed on their soil, but those would likely only be used against rebels, including European nationals fighting alongside the Islamic State group. "Western judicial authorities can perhaps use the evidence they're finding now against returning jihadi fighters... but no one is going to start a trial against Assad's regime or Assad himself," said Ribbelink. Ad hoc tribunals such as those set up by the United Nations to judge crimes committed in Yugoslavia and the 1994 Rwandan genocide were "part of post-Cold War euphoria, things are different now," he added. Even without a court to bring cases to trial, the CIJA evidence has a role to play. "If we wait for the ICC, or if we wait for an ad hoc tribunal, a lot of this evidence is somehow going to be lost," said Kersten. "There will be the opportunity to shred it, there'll be the simple passage of time so people won't be there to recall events as easily." The mere existence of the evidence is potentially damaging for Syria's government as "it could become difficult for a number of states to continue to support the regime," said Ribbelink. But there is no certainty that the millions of documents, photos and videos collected by the CIJA, many at great risk, would be admissable in court. There have been precedents for independently collected evidence being used in international prosecutions, including at the ICC, but it could be deemed corrupted, said Jill Coster van Voorhout, researcher at The Hague Institute for Global Justice. "There can be a few obstacles, for example when the evidence has not been collected for the purpose of a trial," said Van Voorhout. "In such a case, the evidence could be considered corrupted and therefore not accepted or given less evidentiary value before a court." Law expert Kersten said that the CIJA evidence must be tested in court to know if it's strong enough, but whether that happens depends on the international community. prosecute not just Assad but anyone, those most responsible from both sides of the conflict," Kersten said.